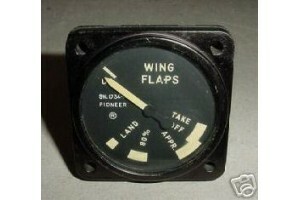 2 1/4" Vintage Warbird Jet Flap Position Indicator. Manufactured by Pioneer. P/N 24100-11J-4-A1. Very clean item. It would make an excellent show item of the office or home or as a mock up panel instrument.